After opening with a generic shot of the downtown L.A. skyline, the first location we see in Matchstick Men is the home of Nicholas Cage's character ('Roy Waller'). This is an actual home, located at 3508 Meier Street, in a residential neighborhood between Venice and Culver City, in west L.A. The house is on the east side of Meier Street, the second house south of Palms Blvd, four blocks north/northwest of Venice Blvd. It's easily recognizable from the tree growing up through the "roof", and those V-shaped vertical poles. The photo below, like almost all of the photos on this page (other than the screencaps) was shot by Chas Demster, who made this movie his personal project. He also tracked down virtually all of the Matchstick Men locations. Then Roy gets dressed and goes off to work at the office he shares with his partner in crime, 'Frank Mercer' (Sam Rockwell). That office is located at 6829 Lankershim Blvd, in North Hollywood. That's on the west side of Lankershim, just north of Vanowen Street, on the east side of the San Fernando Valley. It's about a mile and a half west of Bob Hope Airport and Valhalla Cemetery. From the signs, it appears that it now houses Datagraphic Computer Services, Inc.
Roy & Frank then set out to scam their first victims of the day, a nice senior couple. Disguised as Federal agents, they con the couple into signing over a bank voucher with their bank account number. We first see the pair of cons in their car, pulling into a hilly residential neighborhood in the hills, on route to the victims' house. A sign on the corner reads "Laurel Hills". 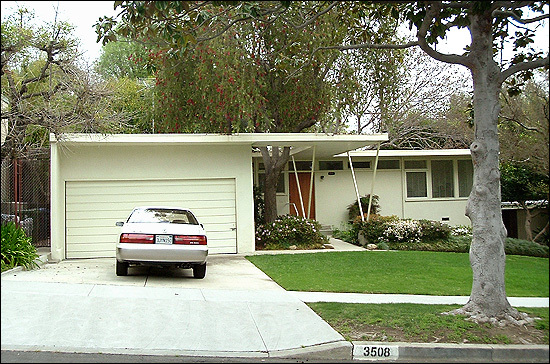 The house itself is at 8523 Edwin Drive, in that Laurel Hills neighborhood. The scenes of him walking to the shrink's office was filmed at the Magnolia Park Arcade, a small, street-level collection of offices at 3607 W. Magnolia Blvd, in Burbank, CA. That is located on the north side of Magnolia, four storefronts west of the northwest corner of Magnolia & Cordova. When the scene starts, and we see Nicolas Cage get out of his car, the buildings we see behind him are at the southeast corner of W. Magnolia Blvd & N. Cordova Street. As he enters a small patio area, a sign lists the shrink's office as Suite E. In the real world (as of 2009), Suite E is actually occupied by James J. Reid, Real Estate Appraisers. In fact, you can see that same name on a shingle (in the movie), as Nicolas walks north into the arcade area (in the photo above). 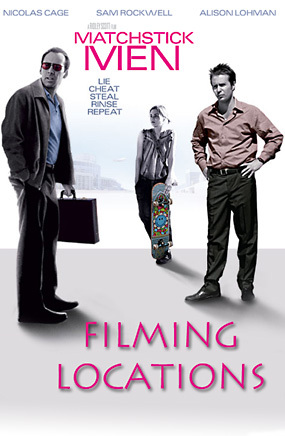 Roy is informed by his psychiatrist that he has a daughter: a 14-year-old named 'Angela' (Alison Lohman), and he arranges to meet her for the first time. We see him in his car, parked next to a public park. Not knowing what she looks like, he watches girls pass by, hoping to spot her. Finally, he sees her riding a skateboard, and they meet. That park is Veterans Memorial Park, at 4117 Overland Ave., in Culver City, CA. His car is parked on the east side of Coombs Avenue (on the west/southwest side of the park), just north of Barman Ave.
After their initial meeting at the park, Roy & Angela go to a nearby diner for a burger and a brief father/daughter talk, before he takes her home. 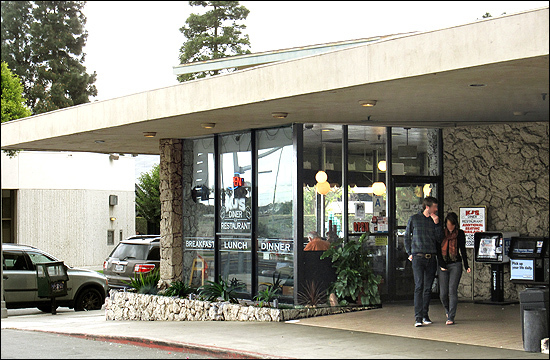 That diner, formerly known as Pepe's Galley, and now called KJ's Diner & Restaurant, is located just north of LAX, at 8731 Lincoln Blvd, in Westchester. That's at the northwest corner of Lincoln & Loyola Blvd, a block south of Manchester Ave, right next to the bowling alley that is seen later in the film.